Sony announced its Bloggie Touch Full HD camcorder yesterday and we've had a pick-up-and-play with one at the Sony stand here at IFA. The unit is a lot more compact than the Flip HD line and you can shoot 1080p instead of the 720p found on the Flip HD and the iPhone 4. It uses Sony's Exmor CMOS sensor and can focus on objects as close as 10cm away - this is a particular weakness with many pocket camcorders. The 8GB unit is actually quite a looker, with a brushed aluminium body that looks as though it could withstand a few knocks. Sony is also still going on about shooting 360-degree video using a clip-on lens, but the results remain terrible – surely this isn't of any interest to anybody? 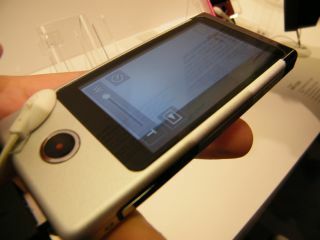 The interface is much-improved over the first generation and things are really easy to use on the 3-inch touchscreen. Uploads are via a USB cable and the Bloggie's own software. You can also take 12.8 megapixel stills, too, even if you're taking video with the device at the same time. The Bloggie Touch is available in pink, silver and black.